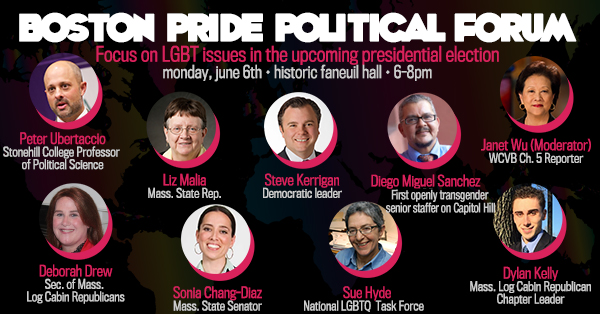 As part of Pride Month, Boston Pride will host a public forum on Monday, June 6, 2016, from 6:00 p.m. to 8:00 p.m., at historic Faneuil Hall to discuss the issues important to the LGBT community in the upcoming presidential election in November. The Forum will focus on both domestic and foreign issues that affect the LGBT community including civil rights and discrimination against the LGBT community, particularly to transgender individuals; marriage equality; immigration and more. The Forum will be moderated by WCVB Ch. 5 Reporter Janet Wu. The Forum will also give the audience the opportunity for Q and A with the panelists. The event is free and open to the public.